FA: Vern Clevenger, Tom Higgins, Bob Kamps, July 1972. A quality, sustained slab with edges and tiny knobs. The first pitch starts up a somewhat grungy corner, then traverses on easy terrain to a horizontal crack and a few thin edging slab moves to a bolted anchor. 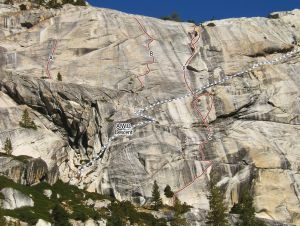 The second pitch climbs up then right, then up past three bolts and a significant runout with sustained climbing past the 3rd bolt to gain the two-bolt anchor. Rappel back left to the start ledge with two 60m ropes, or continue up for another pitch of easy climbing and walk off. Which SuperTopo guidebooks include a topo for Faux Pas?